Vanson have been around for donkey’s years (over 30 years) and hold the distinction of being the largest motorcycle leather manufacturer in the United States. This outstanding Vanson ‘Triton’ Jacket is obviously named after the British classic Cafe Racer that combines the engine of a Triumph and the featherbed frame of a Norton to create the ulimate motorcycle. But the jacket also has a Scottish influence, with the Scott’s claiming to have invented waxed cotton canvas and also Royal Stewart tartan which forms the lining of this first-class jacket. Here’s what Vanson say about their jacket “From the first second that you put this jacket on, you’ll feel the quality of its components and manufacturing. The heavyweight waxwear fabric has a solid heft and a great waxy drape. The snaps and zippers are substantial and work smoothly. Vanson is respected worldwide for the strength of their jackets and this one is no exception. You’ll appreciate it more year after year as it ages and gains more character”. 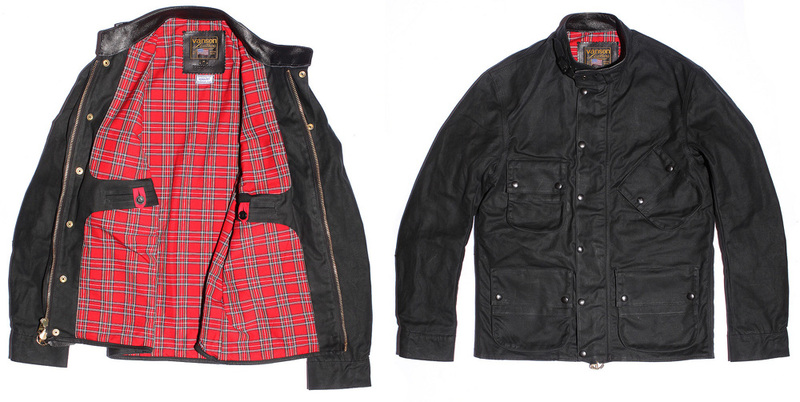 To see more pics or to buy one of these old school jackets visit the Epaulet Shop. [A note to Vanson if you happen to read this, please redesign your website].